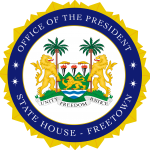 State House, Freetown, Tuesday 19 March 2019 – High Commissioner designate from the Republic of Botswana and Ambassadors designate to Sierra Leone from the Islamic Republic of Iran and the Philippines have presented their Letters of Credentials to His Excellency President Julius Maada Bio during a ceremony held at State House. During the presentation, the High Commissioner from Botswana, Pule Batimanki Mphothwe, said he felt humbled to present his Letters of Credentials, which would officially start his diplomatic work in the country. He said Botswana and Sierra Leone had had a very good relationship since the official establishment of bilateral ties between the two countries in 2004. He said the two countries had supported each other in a number of areas. He mentioned that the Botswana Police Service had been supportive to Sierra Leone in the training of personnel of Sierra Leone Police on community policing, human rights and crime investigations at the Botswana Police College. He said his Government also supported Sierra Leone with modest contributions during the Ebola and Mudslide. The High Commissioner expressed hope for more areas of collaboration between the two countries during his tenure in the Sierra Leone. Ambassador from Iran, Akbar Koshrawi Nejzhad, said his mission was an outstanding indication of the importance attached to Sierra Leone from the Islamic Republic of Iran to develop its bilateral relations in every aspect. He said his top priority in the country was to improve Iran’s involvement in Sierra Leone’s quest for economic development and the deepening of bilateral ties to serve the common interests of the two countries. On her part, Ambassador from Philippines, Shirley Ho-Vicario, said the event marked the strengthening of the relationship between the Philippines and Sierra Leone, which she said was diverse but united in delivering on promises. She said the Philippines aimed to pursue her political, economic and cultural initiatives with Sierra Leone and to ensure that citizens live in peace, stability and significantly improve on their lives.